This tropical plant, needing plenty of heat and humidity, may find a temporary home in a partially shady spot of your summer garden, but pot culture is more practical for an extended growing period. The best way to start ginger is to purchase a fresh (not dried or frozen) root at a grocery store in early spring. 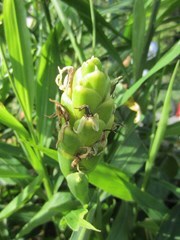 Cut the root (rhizome) into 1- or 2-" sections but long enough to include several healthy-looking, well-developed growth buds. Let the cut ends callous over (dry out) a day or so, then plant just below the soil surface in fertile, well-drained soil. Water sparingly until top growth develops, otherwise the rhizome could rot. Once established, water heavily, fertilize monthly, and keep in a partially shaded location. Provided with adequate space, ginger can reach a height of 4' with a 2- to 3-foot spread. Bring in before temperatures drop below 50 degrees F. Rhizomes may rot in cold wet soil. Allow several months before harvesting to allow rhizomes to reach adequate size. With care, new sections may be harvested while allowing the remainder to continue growing. Zingiber officinale, known as the true ginger used as a spice, is one of the oldest known and most widely consumed spices. Genus name comes from the Greek name which, in turn, is said to derive from an East Indian word cognate with Pali sigivera. Specific epithet means sold in shops and was applied to plants with supposed medicinal properties. Rhizomes are subject to root rot in cold and wet conditions. The fresh or frozen rhizome is grated and used in Eastern recipes in soups, stir fry, and numerous other meat, poultry and seafood dishes. Crystallized ginger root is a popular Asian confection. The young sprouts are also edible. Dried and ground, the spice has a Western culinary tradition in baking, candies and puddings.